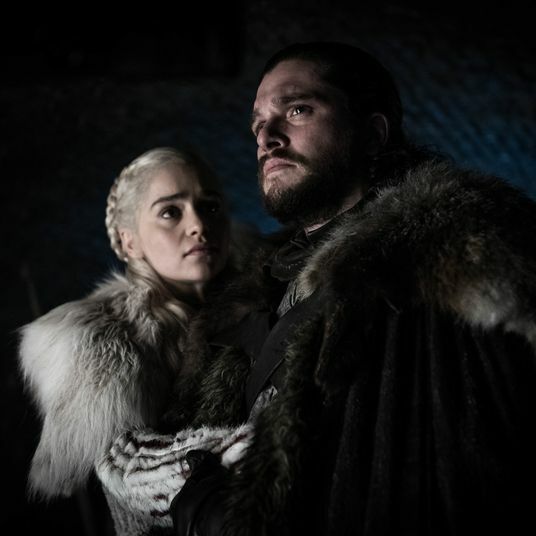 Ahead of Game of Thrones returning to HBO for its final season later this month, Kit Harington makes his Saturday Night Live hosting debut this weekend alongside musical guest Sara Bareilles, and the first promo is extra special. One thing is clear: Leslie Jones will not be stopped from turning her ultimate Game of Thrones fantasy into a reality. The dream involves an impressive collection of toys, lots of dragon noises, a gorgeous cardboard throne, and yelling “SHAME!” at Harington as he’s cruelly pelted with doughnuts. Catch the rest when Harington’s episode airs this weekend, which will be followed by returning host Emma Stone on April 13 alongside musical guest BTS. Read Vulture’s guide to every Game of Thrones season, recapped and explained.